TRIATHLON: The skinny blonde kid who played Aussie rules as a seven-year-old is now a Commonwealth Games gold medallist. Matt Hauser started triathlon training under renowned Hervey Bay coach Brian Harrington only seven years ago, and on Saturday scored what was arguably his greatest sporting achievement at the Gold Coast. Hauser, who turned 20 on Tuesday, teamed with Ashleigh Gentle, Gillian Backhouse and men's individual silver medallist Jacob Birtwhistle to win gold in the mixed team relay. "I just missed out on the medal on Thursday and I came back for redemption with the team here today," Hauser said. 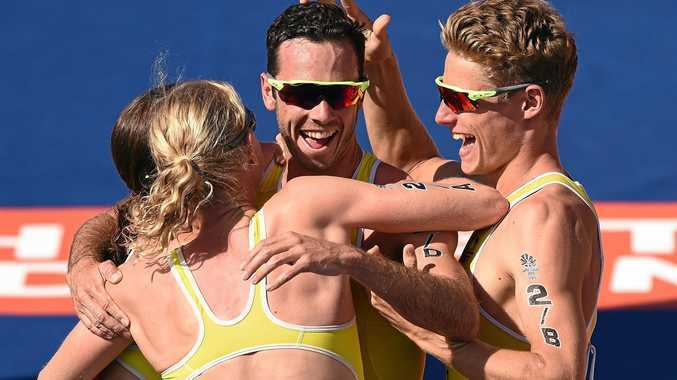 "We had our sights set on gold." It was the support from his home region that meant the most to Hauser. Hervey Bay Triathlon Club members packed out the Beach House Hotel to watch the Xavier Catholic College graduate compete in the individual event on Thursday. A large number of supporters travelled from the Fraser Coast to be among the crowd, which celebrated Australia finish 52 seconds ahead of England. New Zealand finished one minute later for bronze. With a Gold Coast Games gold medal hanging from his neck, Hauser said the home-town support meant the world. "It means the world to me to have so many people from Hervey Bay to come down here and to celebrate (his results)," he said. "It was fantastic to have the whole HBTC community behind me and to see videos and photos of the event, it was really heart-warming and made that fourth place on Thursday all the more exciting." Harrington, who along with Hauser's mum Vicki was volunteering at the event, could barely contain his excitement. "It was the best-ever," he said. "The whole team put in, it was a fantastic race. What Matt did against (England's) Jonny Brownlee, he can say he's beat him fair and square. "The amount of training, how hard he works, his passion for the great sport of triathlon. We all knew he'd go a long way and he's proven it." Matt's dad Darren said it was an amazing feeling to see his son atop the Commonwealth Games dais. "Just knowing how much work he's put in to get to this point, to represent his country, is just amazing," he said.